What a wonderful second week of school we are having! Our students are quickly normalizing to school and we are so proud of them. Thank you to our PTO who helped to comfort our new parents with the Yahoo and Boohoo breakfasts last week. Thank you to our families who donated to the Hurricane Relief efforts. Our school filled two large boxes with new children’s clothing and toiletries to support the hurricane victims. This was a great way to share our support with others who are in need. Our afternoon car rider line efficiency continues to improve each day! Encourage your child to listen for his/her name in the hallway. Also, please pull forward as directed by staff on duty. We are working to make sure children are dismissed to the car rider line as quickly as possible! Below are some friendly reminders to help keep staff and students safe during carpool. 2. Do not talk on your cell phone or use your laptop during car pool. We need everyone to focus during this time for the safety of your child and other children. 4. Display your sign in your windshield so staff can quickly read the name(s) of your child(ren). Some of the signs are resting on the dashboard and are difficult to see. 5. Be sure to have yellow signs for each person (husband/wife, grandparents, uncles, aunts, babysitters, etc.) who will pick up your child(ren). We ask that all afternoon transportation changes are communicated to the office (Ms. Emily: emilyf.tremoulis@cms.k12.nc.us) and your classroom teacher via email no later than 3:00pm. We are experiencing numerous phone calls in the main office concerning transportation changes near or at dismissal time. This causes disruptions in the main office and our classrooms. This new process will ensure that we are accurately sending students home in the way you are requesting, allowing us time to notify the teachers, and that you feel comfortable concerning the afternoon procedure for your student. Thank you for supporting us as we make changes to help our school run more efficiently. Please continue to encourage all bus riders to use peace and courtesy when riding the buses. We want to ensure safety of our bus riders, as well. Chantilly is an amazing school and I look forward to working with parents and staff to continue the wonderful traditions! The new year has started and it’s time to get our outdoor learning spaces spruced up! Our focus for this Saturday’s beautification day will be clean up of the classroom gardens, harvesting for spaghetti dinner, preparations for fall plantings, and sprucing up the main entry area to the school. Bring your family (there will be jobs for all ages), gardening gloves, and any tools you may have. We will work in the gardens from 9am-1pm, and a pizza lunch will be provided! Chantilly alumni and any middle and high school students who want to earn community service hours (or who just want to help out) are welcome to volunteer. Drop in for as much time as you can spare, or stay the whole morning! See you in the gardens! Girls in 3rd-6th Grade are invited to register for Chantilly’s Girls On the Run team! Girls on the Run inspires girls to be joyful, healthy and confident using a fun, experience-based curriculum which creatively integrates running. Our team practices before school on Monday and Friday mornings, and the season culminates with the running of the Girls On The Run 5K in December. Online registration ended on September 5th, but there may still be spots available. If interested, please contact Coach Krista at kristamark1@gmail.com. Practices start September 18th. Visit www.gotrcharlotte.org for more information. Students in grades 3-6 are invited to participate in the Chantilly Montessori School chorus – a before school program. We will rehearse each Tuesday in the music room beginning at 8 a.m. Our first meeting is Tuesday, September 12th. There is no fee for this program. Participation in the group provides students with an expanded opportunity to learn the art of choral singing. We sing partner songs, rounds, and songs that connect to our peaceful world and the students’ curriculum. Upon arrival at the front of the school, students should enter and proceed to the music room. Please do not drop students off before 7:50 am. You do not need to bring them into the building unless you wish to do so. They will remain with me until the chime rings at 8:45 at which time they will go to breakfast or to their classroom.Siblings are not permitted to accompany chorus members to school as there is no one to supervise them. Contracts will be handed out Tuesday and will need to be signed and returned by September 19th. During the first week of this year’s Invest in Your Child (IYC) campaign, 45 families have already contributed $5,600 toward our total goal of $12,000. A huge thank you to those of you who have already donated! But we still have a ways to go toward that monetary goal. More importantly, we would like to get more families involved in this important campaign, at whatever level they can. IYC funds are separate from the parking fundraiser money, which supports PTO programs. IYC funds are used directly in the classrooms, for new and replacement Montessori-specific materials. They are very important to the work your child does each day in school. For those who are interested, we are again offering the IYC Pass at $100 for one child, or $150 for two or more children, which includes a family PTO membership ($10 value) and one yearbook ($15 value). If your employer matches charitable donations, they can contribute to IYC, too. If you have not yet contributed, please take a moment to complete and submit the IYC form that was provided with your child’s back-to-school packet. If you can’t find the form, you may print it out from the PTO website. If you have any questions, feel free to email us anytime at chantillyiyc@gmail.com. Thank you in advance for helping to support Montessori education at Chantilly! Opening a new school campus is hard work! Our staff and families have given their all to make the opening of the new campus at Williams Secondary Montessori a success. If you’d like to come see and learn more about Secondary Montessori, sign up for a Wednesday Walk-through. Notice parents sporting their Williams Montessori Inaugural T-shirt? If you’d like to purchase one, visit the Williams Montessori Cheddar Up site to purchase your own. Include your child’s name, teacher, and school on the form, and we’ll make sure it gets to you! Mark your calendar for the Willliams Montessori Ribbon Cutting event – October 10, 10am! Welcome to the 2017-18 school year! I am pleased to say that our school year is off to an EXTRAORDINARY start as all of our students are settling back into the school routine! We have had a smooth beginning to the new school year and I appreciate the support of our Chantilly Community. I also want to thank our PTO who helped in so many ways to make the beginning school year special for our staff and students. Your involvement in our school makes it a very special place to learn and grow. I am honored to serve as your new principal! I have experienced firsthand the outstanding staff of professional educators who are all dedicated to Montessori education and the success of each child! I also know that Chantilly has a dedicated, strong community of supports who are committed to the success of the school. My professional experiences prior to becoming Principal of Chantilly include over twenty years of experience in CMS as a teacher, assistant principal, principal and working two years in our district central office. Family is my number one priority. I have been married for seventeen years. I am the mother of two wonderful boys. I attended college at North Carolina Central University with a Bachelor’s Degree in Elementary Education. I have worked at numerous schools in the district as a teacher. During this time I graduated from the University of North Carolina at Charlotte with a Master’s Degree in Educational Leadership and Curriculum Specialist. I have served as an Assistant Principal at J.H. Gunn Elementary and a Strategically Staffed Principal at Sedgefield Elementary School. The last two years of my career, I was asked to join former Superintendent, Ann Clark for a special assignment. During this assignment, one of my greatest accomplishments was founding and creating the North Star Reading Initiative. As your principal, I will strive to continue the strong traditions of Montessori and continue to help staff with professional development opportunities to learn to help shape the WHOLE CHILD. I want every student to have an engaging, challenging learning environment supportive of critical thinking, individual discoveries that form caring members of our world. As educators, we will continue to refine our instructional practices through reflection time and personalize the education for each of our students. Please mark your calendar for our next school event on Thursday, September 14 at 6:30 pm for our Curriculum Night. This will be an informative evening you will not want to miss! Prior to this event at 6:00 pm, our PTO will host a general PTO meeting. All families are welcome to this event. We need all families to join PTO and find a volunteer opportunity to support our school and your child’s education. We will continue to host two sessions for families that have multiple siblings. There are a few upcoming dates to mark on your calendar. Tuesday, September 19, the Girl Scouts and Boy Scouts will host a recruitment meeting at the school from 6:00 p.m.-7:00 pm. Thursday, September 21 and Friday, September 22, there will be no school for students as they are designated Teacher Workdays. Wednesday, October 18 is our district’s first Early Release Day. This day is used for Professional Development for our staff. Students will be dismissed at 12:15 pm on this day. Please make provisions early for this day. If you need after school care, contact our After School Enrichment Program now by calling the main office. Below, please find a number of other important updates and reminders. All families are asked to take two minutes to fill out this online information form: https://docs.google.com/forms/d/e/1FAIpQLSchyFJqh-kBA1amkf2rVXdfTwKvhO8J3gdJCzDBDmKQwgCKIQ/viewform?c=0&w=1. Please fill out one form for each child you have at Chantilly. The information collected here will help the PTO compile the school directory, will ensure your child’s name is listed as you prefer in the yearbook and, importantly, will give you the chance to register your interest for various volunteer opportunities at the school. If you have any questions, please email Lauren Sawyers at lauren_y_sawyers@yahoo.com. Welcome back Chantilly families! My name is Trevor O’Reilly and I am this year’s PTO President. We are excited to start off the new school year and I would like to share some important information regarding communication and how to get involved. Our website designer is working diligently to input all the necessary information into our new Chantilly PTO website. Be on the lookout for an email announcing the launch for that in the next couple weeks. It will be a hub for any and all information. Here is the link to join our new text-based form of communication to keep up to date on all social events and any pertinent PTO news: https://www.remind.com/join/b2g737. And here is the link to join our Chantilly PTO announcements Google group: https://groups.google.com/forum/#!forum/Chantillyptoannouncements/join. Please join this Google group to stay informed on all things Chantilly! First General PTO meeting 6:00pm in conjunction with Curriculum night. Thankful Thursdays are a chance to bring in goodies to remind our teachers and staff how much we appreciate them and all they do for our kids. And it’s simple to do! Families volunteer to bring in food or supplies the first Thursday of each month. The first Thankful Thursday is Thursday, September 7! For more information or to sign up to contribute, visit: http://www.signupgenius.com/go/10c084da9a722a0fe3-201617. If you have any questions, please email Lauren Sawyers at lauren_y_sawyers@yahoo.com. Enjoy lunch or dinner at the 1701 E. 7thStreet location on Wednesday, September 6. Our school will receive 15% of the total sales from customers who mention Chantilly Montessori when ordering! The new year has started and it’s time to get our outdoor learning spaces spruced up! Our focus for the fall beautification day will be clean up of the classroom gardens, harvesting for spaghetti dinner, preparations for fall plantings, and sprucing up the main entry area to the school. Bring your family (there will be jobs for all ages), gardening gloves, and any tools you may have. We will work in the gardens from 9am-1pm, and a pizza lunch will be provided! Drop in for as much time as you can spare, or stay the whole morning! See you in the gardens! Join the Chantilly Montessori community gathering on Friday, September 15 from 4:15 p.m.-6:00 p.m. on the lower field. Free popsicles and social time for the children, parents, siblings and guardians. Welcome back! Last year Chantilly Montessori raised $500 in Boxtops for Education that students collected. This money goes directly back into the school to help fund events that benefit our students and staff. This is a program that helps schools earn cash by clipping the official Box Tops for Education Boxtops from the packaging of hundreds of different items. Simply collect the Boxtops and drop them in the collection box in the office or send them in with your child to give to their teacher. You can find Boxtops on a variety of packages, anything from school supplies to taco shells. Each Boxtop clipping is worth 10 cents and that can really add up quickly! Girls on the Run Registration is OPEN! A big thank you to those of you who have already contributed to this year’s Invest in Your Child (IYC) Campaign. IYC funds (separate from the parking fundraiser money, which supports PTO programs) are used directly in the classrooms, for new and replacement Montessori-specific materials. This year, we have already raised about $2,000 toward our annual IYC goal of $12,000! If you have not yet contributed, please take a moment now at the beginning of the school year to fill out and send in the IYC form in your child’s back-to-school packet in the envelope provided. (If you can’t find the form, it is now available on the PTO website.) For those who are interested, we are again offering the IYC Pass at $100 for one child, or $150 for two or more children, which includes a family PTO membership ($10 value) and one yearbook ($15 value). If your employer matches charitable donations, they can contribute to IYC, too. But even if you do not want to purchase the pass, please make a donation, in whatever amount you can. This year, our goal is really to get as many families as possible to participate. Last year, about half of Chantilly families participated. Please help us increase that percentage this year. These funds are essential to providing our children’s classrooms with the materials they need for Montessori education. If you have any questions, feel free to email us at chantillyiyc@gmail.com. Thank you in advance for helping to support Montessori education at Chantilly! With full Middle School and High School teaching teams, multiple electives teachers, administrative and support staff in place, Williams Secondary Montessori is starting off strong. Ten staff members started their training at CMSTEP this past summer. They participated in up to five intense weeks of the first part of their training. Two others returned to continue/complete their training, too. The Williams Montessori campus has undergone major renovations this summer and now the students get to enjoy a fresh new learning environment. For “before” pictures, click here. For “after” pictures visit the Williams Montessori PTSO Facebook page and see how great the school looks now! Also, while checking out the Facebook page, you should click on the news and see how excited our previous principal, Ms. Sophia, is about her new school. The new logo and shirt are quite impressive too. They truly are trailblazers! Williams Secondary Montessori does not only receive support from CMS, but your own Chantilly Montessori PTO has made a generous contribution, too. There was a planned $2000 donation that should have gone to Williams last year, but since it was accidentally overlooked and not donated it will be added to this year’s $2000 donation; making a $4000 donation that goes directly to classrooms of Williams Secondary Montessori right when it is needed the most! It is an honor for Chantilly to spread the joy and help build the Montessori community for the future of all of our children. SAVE THE DATE!!! On Tuesday, October 10, at 10 a.m. there will be a ribbon-cutting/dedication program for Williams Montessori. Our new CMS Superintendent, Dr. Clayton Wilcox, plans to be in attendance. Additional details to come! 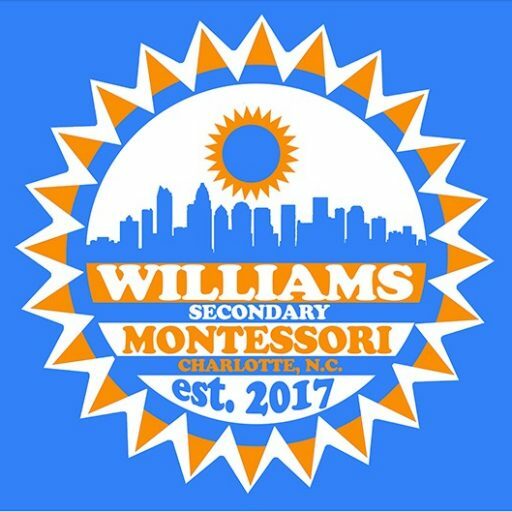 For more information about Williams Secondary Montessori, check out ourFacebook page or CMS Website (still under construction), or contact your Williams Montessori Liaison Kim Hutchinson at kimhutchinson@bellsouth.net.